The Brontosaurus (bron-tuh-SAWR-uhs) is a species of dinosaur in ARK: Survival Evolved, and is one of the largest creatures in the game. Among giant creatures I've seen on the Island, Brontosaurus lazarus is larger than any sauropod I've read about. In fact, the dinosaur is so massive that it serenely ignores most other creatures. I've seen a pack of raptors tear apart small dinosaurs while Brontosaurus continues eating, seemingly oblivious to the hunting pack. Because of how docile it is, the Brontosaurus makes for an ideal pack animal. Peaceful tribes use it to carry incredible quantities of resources, while warring tribes use it to mobilize their army. Its size and strength make it one of the unique creatures on the Island that can support a "platform" saddle. Unfortunately, its enormity means that the process of taming a Brontosaurus can take a very long time. Some may think this is an Apatosaurus, Dreadnoughtus, Argentinosaurus, or some other sauropod, but this is a strange Island, and I'm the one doing the research. I'm convinced that this genus is Brontosaurus, and no one can tell me otherwise. My study, my rules. Brontosaurus is not aggressive, but can deal damage to players or dinosaurs by stepping on them if provoked. Another attack that they do is a tail swipe, which, for low to mid-level characters, can be a 1 or 2 hit death. The tail swipe does more damage than the stomping, has a long reach, and will fling you in the direction the swipe traveled. The Brontosaurus also has a large amount of health. If you want to kill one, ranged weapons or high-level hunting dinos are recommended. The Brontosaurus is a gigantic sauropod dinosaur, unmistakable for any other species in both size and appearance. It is usually found alone or in small groups, browsing at heights well above that of smaller herbivores or along beaches. Its size and strength make it almost impervious to predation... save perhaps for audacious tribes. This section displays the Brontosaurus's natural colors and regions. 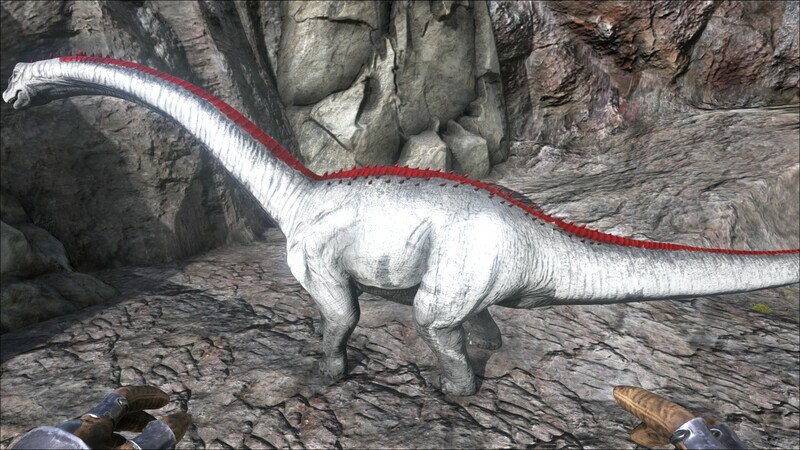 For demonstration, the regions below are colored red over an albino Brontosaurus. The colored squares shown underneath each region's description are the colors that the Brontosaurus will randomly spawn with to provide an overall range of its natural color scheme. Hover your cursor over a color to display its name and ID. 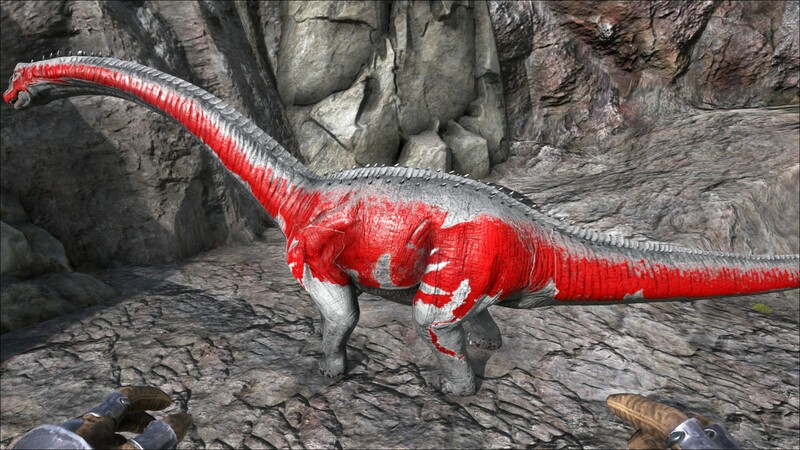 For example, "cheat SetTargetDinoColor 0 6" would color the Brontosaurus's "body" magenta. To get the Sauropod Vertebra you must access the dead dinosaur's inventory. Because of the Brontosaurus' sheer size, they drop large quantities of Raw Meat and Raw Prime Meat. Because of this, killing a Brontosaurus is ideal for a carnivorous effective tame, such as a Rex. That is, before it spoils due to its fast spoil timer. Recommended to kill a Brontosaurus close to your tame so the prime meat doesn't spoil. The best method would be using a Scorpion, Tranquilizer Arrows, or Tranquilizer Darts, but if those are not available to you, then a simple Slingshot will do the trick (100+ stone). Attacking a Brontosaurus from the top of a tall, steep cliff can allow you to attack it while staying out of range of its powerful attacks. Lay down a wood or stone foundation with 3 wood or stone walls and wooden one door. Above the first layer place 4 wooden frames with no doors. Stand inside your shelter and shoot it. It won't damage you just your shelter. Get a friend to pick you up with a flyer and fly you over the bronto. From there you just need to shoot it. Just make sure that you and your friend are high enough so the bronto can't hit you! You can shoot the bronto while riding another land mount and kite it to a safer location for taming. You can outrun the Brontosaurus backwards. just walk backwards facing the Brontosaurus. After that shoot it with your Tranquilizer Arrows. This section describes how to fight against the Brontosaurus. 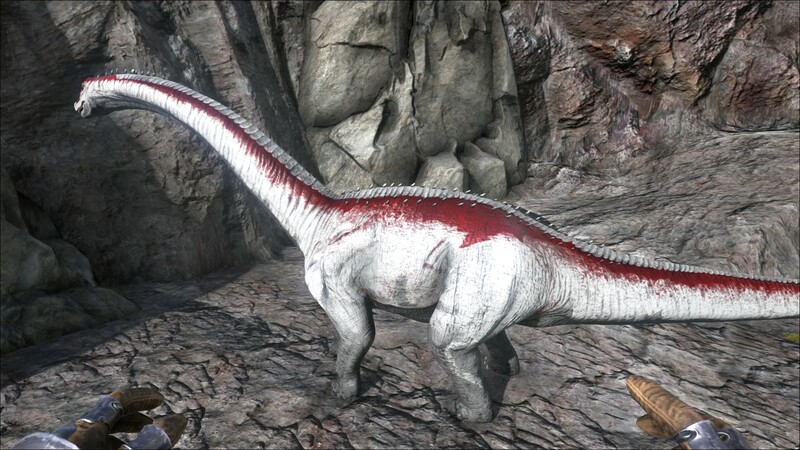 The Brontosaurus has the second highest health pool of any herbivore behind the Titanosaur and it has the base damage of a Rex. Their attack has a massive range and huge knockback which makes this creature dangerous when riled up. Avoid, unless it is necessary to attack. Also, try to avoid attacking small creatures such as Dilophosaurus, near a Brontosaurus, as you could accidentally hit the Bronto, and aggro it. If on foot, try to keep distance. Their tail-sweeping attack has a massive range and can knock a player or attacking animal off slopes or cliffs. They can be stuck behind rocks and cliffs and shot at safely. A strong mount can defeat the Bronto with dedicated attacking, but your mount must be able to withstand a high amount of damage. Large carnivores like a Rex, Spino or Giganotosaurus can kill a Bronto with ease, provided the player does not make a mistake during the battle. 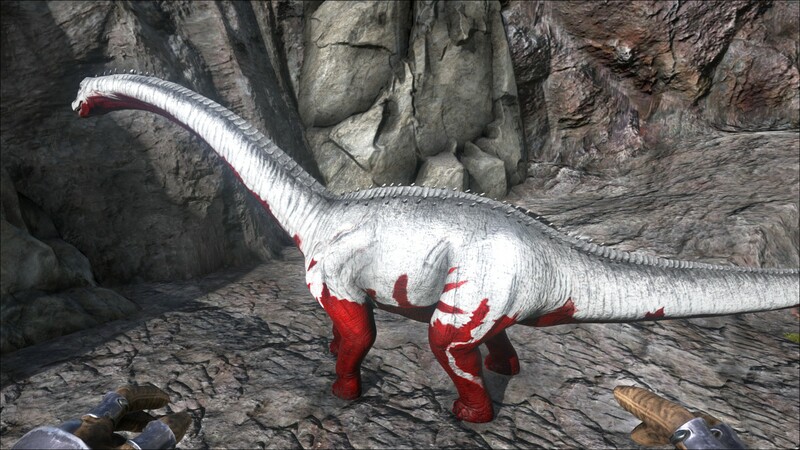 It is extremely easy to kill a wild Bronto even at lower levels by getting its attention and then sailing out into deep waters far from land with it following you. While sitting in the pilot's seat of a raft, it won't acknowledge your presence, and thus you may drown it by simply getting it further away from shore than it can swim back, and it will sink until it dies. Transport: While slow, it has the third best base carrying capacity in-game. Good for local transport (Level up Weight, Movement Speed and Stamina). The full name roughly means "God-helped thunder lizard". Brontosaurus are one of the endgame berry farming machines you will wish to have. Use their attacks against large groups of bushes to gather more than a hundred berries. Depending on your location, you'll be able to farm more than 1500 Narcoberries in one, single ingame night. Also, due to their enormous weight capacity, they make effective, albeit slow, transporters of large quantities of goods. The Brontosaurus is so large that when it steps on smaller creatures (such as trilobites, meganeuras, or dodos) it deals damage to them and sometimes even kills them. This can be a problem, especially when navigating through swamps, as you frequently step on Meganeuras, killing them and causing a couple of them to attack you at a time. One tail sweep often kills all of them, earning you a lot of experience points. The skull of the animal shown in the dossier is not of the real-life Brontosaurus, which to this date has yet to be found, but Camarasaurus. This appears to be a reference to the previously common use of Camarasaurus skull casts for sculpted models of Brontosaurus skulls, before it become widely accepted that Brontosaurus most likely had a Diplodocus-like skull. The species name is Lazarus. This is quite similar to Lazarus Chowder. This page was last edited on 31 March 2019, at 21:57.